Which US State Works Out The Most? Anyone who's ever forced themselves out of bed for a pre-dawn run knows how hard it is to get a workout in these days. That said, some states' citizens are more successful at overcoming the snooze button than others, and a new data analysis by the Wall Street Journal gives us a clearer picture of who those frontrunners are (pun definitely intended). The WSJ examined data from the 22 million users of Under Armour's MapMyFitness suite of mobile apps, which detailed each user's location, the time they spent exercising, and the style of exercise undertaken. Then they compiled that data into the handy infographic below, because that's what you do with data these days. The result? Californians scored top marks, spending an average of 87.4 minutes working out each week, with Coloradans following close behind at 84.2 minutes, and Washingtonians closing out the top three at 82 minutes. On the opposite end of the spectrum, the Frank Underwood-types in the nation's capital spent a measly 43.2 minutes per week working out -- insert your political joke of choice here. 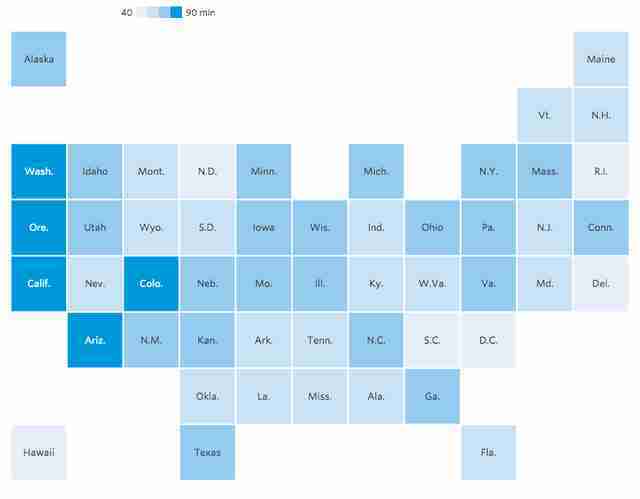 The WSJ's data scrape also revealed that, with the exception of West Virginia, Nevada, and Arizona, running was overwhelmingly favored as the country's most popular exercise method -- check out the entire data set on the WSJ's interactive infographic.